Port Ludlow, WA (September 19, 2018) – Michael and Elizabeth (Liz) Fessler, founders of Herbalix Restoratives and representatives for the revolutionary OligoScan, will present at the Academy of Comprehensive Integrative Medicine (ACIM Integrative Hands-On Workshop for medical practitioners – Part III on September 20 – 22, 2018 in Irving, Texas. The OligoScan, designed to measure intracellular heavy metal intoxication via the skin using spectrophotometry, is used in conjunction with Herbalix’s detox products, which have botanical, osmotic properties and are clinically proven to purge aluminum from the body. The Fesslers will be presenting: Part One – Disruptive Effects of Aluminum (Al) on Sodium/Potassium Channels in Humans, and Part Two – Clues to Bioremediation of Heavy Metals in Humans Using the Skin Pathways – Skin Purging Techniques for Heavy Metal Detoxing. Can Coriander (Cilantro) chelate metals? This herb is used in many food dishes and found in the Mediterranean Diet. This herb is used in many food dishes and found in the Mediterranean Diet. A number of vitamins A, B1, B2, B3, B5, B6 (Folate), Vitamin C., E & K are found in coriander including traces of minerals such as magnesium, potassium, iron, calcium, zinc. contains antioxidants and has amazing antibacterial activity against germ negative and germ positive bacteria by breaking down cell membranes. Besides its antibacterial effect, the use of coriander oil in antibacterial formulations effectively kills pathogenic bacteria related to food borne diseases and hospital infections. It contains biosorbents effect to absorb liquids and solids: According to a study Coriander (Coriandrum sativum L.) essential oil: “Its antibacterial activity and mode of action evaluated by flow cytometry”. Filomena Silva, Susan Ferreira, Joao A. Queiroz and Fernanda C. Domingues – Journal of Medical Microbiology (2011), 60, 1479-1486 DO1 1Q10.1099/jmm 0.034157-0 034157 @2011 SGM. While researching information on coriander, sometimes seemingly unrelated subjects can provide new leads such as The Uptake of Fluoride, Aluminum and Molybdenum By Some Vegetables From Irrigation Water by Arjun L. Khandare., G. Shanker Rao – National Institute of Nutrition (ICMR), J.Hum.Ecol., 19(4):283-288(2006). One of the vegetables used in the study for aluminum salt loading, was coriander. In a graph comparing amaranth and coriander from aluminum in irrigation water, the concentration of aluminum in coriander was 4 times greater compared to the control. The bottom line is that coriander absorbs metal ions from aluminum in water. In 2005 Herbalix Restoratives sponsored a clinical study. The purpose of the study was to see how coriander works in HR topical Nighttime Cleansing Detox Deodorant®. We arranged for two labs to take tape samples of NCDD and a leading antiperspirant for comparison. The first lab used CuDerm Strippings consisting of 3 each of the NCDD, 3 of the antiperspirant and 2 blank strippings. The CuDerm Strippings were then transferred to a black paper and sent off to a second laboratory to be tested for ICP-MS Spectrometer analysis. After testing the strips the second lab emailed back to the first lab to inform them that because they had applied the strips on a piece of black paper, the test results showed an abnormal reading of elevated alum from the NCDD over the antiperspirant. How could a deodorant contain this much aluminum? The answer is that all NCDD samples showed the ability to draw the black ink (made from aluminum) from the paper thus became a discovery showing the ability of NCDD to chelate aluminum from an inorganic source. Below are the numbers that established the breakthrough. That works out to 70 times more aluminum that the NCDD extracted from the black paper. Back in 2004 while learning from sources how third world countries used certain seeds to filter water, the idea of adding coriander seed to a deodorant, at that time a novel idea, brought forth an amazing discovery. In 2006 HR sponsored a clinical trial evaluating subjects for levels of aluminum in the underarm, using the CuDerm tape strips. the first week was used as a baseline without applying any antiperspirant, the second week using antiperspirants and the third week, with the NCDD. Baseline results gave variations of aluminum levels but all individuals showed asymmetrical loading in the non dominant arm (left and right). The second week using antiperspirants showed spiking in one arm vs the other. The third week, with the NCDD, showed reduction of aluminum in the underarms. Subjects returned to symmetrical levels (minimized the effects of antiperspirants) resulting in below baseline levels of aluminum indicating that NCDD was effectively absorbing aluminum. Special Note: Baseline readings of aluminum variations in the samples demonstrate the human burden caused by aluminum (coming from air, water, food, antiperspirants, medication). Additional testing for metal loading can include skin as indicated in these studies. In a follow up clinical trial in 2012, also using human subjects, it was clearly apparent in thermography scans that the NCDD and Sentinel Breast Crème® demonstrated symmetrical release of alum salts present in subjects tested. The asymmetrical loading of alum salts from antiperspirants can lead to health issues especially for women whose breast fluids drain thru the underarms. These tests provide evidence of the ability for a topical detox with coriander to purge metals from the body. After sterilizing six surfaces normally found in the cabin of an airplane such as the seats, toilet handles, trays, etc., the researchers intentionally infected the surfaces with several bacteria, one of which was E. coli 0157, which can cause severe diarrheal disease. This resilient bacteria lived for up to 96 hours on the rubber armrest. The study was partially funded by the Federal Aviation Administration (FAA). The only remedy is to follow good hygiene, wash hands frequently, or use hand sanitizers. Do not touch your face, and wash hands frequently, as it has been proven that hand washing with soap is the best defense against germs. But many soaps are made with harmful synthetic chemicals and additives, which can strip beneficial oils and irritate the skin. Herbalix organic Goats Milk Bar Soap – 99% Effective against germs. Both the Herbalix fresh Goat’s Milk Cream Bar Soap and Botanical Liquid Hand Soap are made from a base of farm-fresh Nubian goat’s milk and contain key vitamins and alpha-hydroxyl acids that naturally help neutralize free radicals through ingredients that help manage troublesome skin conditions. Goat’s milk also has peptides that support natural collagen production. The combination of sustainable plant based botanicals cleans and helps protect skin without drying it our. These soaps contain no synthetic chemicals or petroleum. 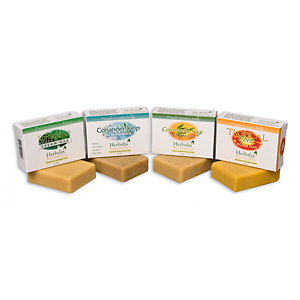 Recommended by naturopaths and dermatologists, Herbalix organic soaps are free of parabens, sodium laurel/laureth sulfates, silicones, and are naturally biodegradable, phosphate free, and formulated without nanotechnology. Herbalix Restoratives Botanical Liquid Hand Soap is made with whole Nubian goat’s milk. Herbalix liquid hand and bar soaps are available in two signature scents including Clary Sage and Tropical Cove, or No Added Fragrance for those who have olfactory sensitivities. The bar soap is also available in a Coriander Kelp Scrub Bar and one more scent – Ceremonial Sage. Herbalix also uses environmentally safe packaging which is ingredient-protective. The BPA-free leach-free packaging ensures that the products remain free of phthalates and other second-hand synthetic chemicals. Herbalix boxes are fully recyclable as well. Today there are more health conscious, savvy consumers. 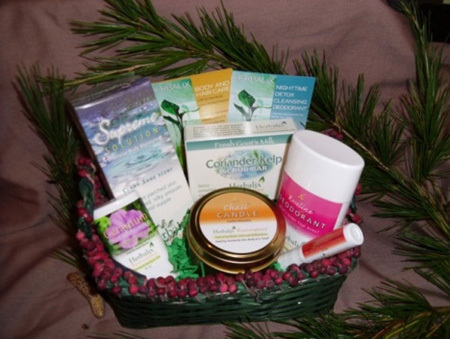 According to the TechNavio report, the Natural and Organic Personal Care Market in the US 2012-2016, this segment in the US will grow at a CAGR of 10.12 percent from 2012 to 2016. A recent study from Fred Hutchinson Cancer Research Center in Seattle, Washington has shown that women who have been taking statin drugs for more than 10 years may face increased invasive breast cancer rates at more than 200 percent. Many physicians will continue to prescribe a daily statin dose to women who have cholesterol levels over 200. According to researchers there are not enough conclusive studies to show that statins actually protect women from fatal heart attacks. According to the study, in the United States today, 25 percent of American women over 45, who have been taking Cresto, Mevacor, Pravachol or Vytorin, Zocor for more than 10 years had a 204 percent increased chance of developing invasive ductal breast cancer. What’s worse, they have a 243 percent increased chance of developing invasive lobular breast cancer. To stay in control of our own health, it is best to be proactive by knowing what direction to take and the desired results. Today many individuals are reviewing with experts their lifestyle changes such as diet, exercise, and skin detoxification. Recent developments in breast health issues are proving to be a game changer. Herbalix formulated Sentinel Breast Creme, designed to help keep breasts clean and healthy. The creme was used by women in a clinical trial showing changes/patterns in the breasts. These changes were tracked and observed thru thermal imaging. The Sentinel Breast Creme is part of the Herbalix 80 Night Lymph Detox Program. When you begin any detoxification program, it means you are cleaning out the body — removing impurities from your tissues, blood, and organs such as the liver. Your body also eliminates toxins through its kidneys, lungs, lymph glands, intestines and even your skin. The benefits of detoxing are many … it can help your body’s natural cleansing process by: stimulating your liver so that it will naturally eliminate any toxins; improve blood circulation; promote elimination through the intestines and kidneys; and provide essential nutrients and energy (fuel) to the entire body. Herbalix Restoratives is a leading organic skin care company specializing in detoxification through the skin. The company works with doctors to develop special detox programs such as Dr. Mitra Ray’s Men’s 60 Night Lymph Detox program. There is also a detox program especially for women — the Women’s 80 Night Lymph Detox Program. It includes the exclusive Sentinel Breast Crème. 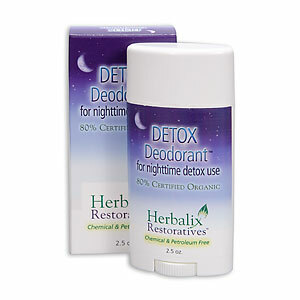 •Nighttime Cleansing Detox Deodorant – cleanses buildup and helps release waste fluids, encouraging lymphatic flow while absorbing all aluminums, and reducing odors. •Geranium Deodorant – Regulates and neutralizes rather than masks odors with a subtle fragrance of geranium essential oil. •Coriander Kelp Scrub Bar – with a blend of coriander seed and kelp to exfoliate dead skin cells and draw out impurities. •Belly Fat Freedom – helps remove toxins and promotes the loss of flab beginning in the belly area. When you begin a detox program, there are several indicators that the toxins are transitioning out of your body, so do not be alarmed. These symptoms should not last more than a couple of weeks and keep in mind, these symptoms might fluctuate with deeper levels of detoxification. 1) Drinking water is essential to the detox process. 2) Eat a simple diet of fresh foods including plenty of vegetables. Avoid caffeine and alcohol; be gentle to yourself and rest as often as you can. 3) Detox side effects might include tiredness, itching, skin eruptions, changes in feces, increased nighttime urination, noticeable body odor, and possible changes in your sleep pattern. 4) Many healthcare practitioners recommend warm water enemas. Dr. Mitra Ray and Dr. Jennifer Daniels who authored Do You Have the Guts to Be Beautiful (Shining Star Publishing, 2011) suggest beginning enemas about a week prior to the Herbalix detox. 5) Be sure to keep a diary and track your body weight and measurements from start to finish of the detox process 30 days later. 6) Be sure to wear old pajamas or a tee shirt as sometimes clothing can be stained. The staining may be a direct result from what is actually coming out of your body. Do not over apply the creams. 7) Avoid wearing metal jewelry, such as earrings, when using these detoxification products – especially not at night. 8) Always remember to use soap to wash off any residue in the morning and use the daytime deodorant provided in the kit instead of commercial deodorants. If any of the above symptoms are uncomfortable enough to make you want to stop, then simply either apply less of the topical creams or take some time off for rest in order to slow down the build up of detox symptoms. Doing so will help your body get into a manageable detox rhythm more easily. You can repeat this detoxification program two times per year for ongoing detox from food xenobiotics, aluminum and other metals, as well as environmental toxins. Now that winter has settled in across the country, many of us are experiencing really dry skin. What many people do not know, is that harsh soaps with chemicals can make the problem even worse. That’s why a good organic skin care product is the best remedy. Look for organic skin care products that include ingredients like avocado oil which can actually help regulate your skin’s natural sebum oil levels. Herbalix Restoratives (www.herbalix.com) features one of the best oil based moisturizers – Supreme Solution Intensive Body Moisturizer – which has been formulated using a rich and expensive blend of pure, non-RBD oils (not refined, bleached or deodorized), that penetrate deeply and hydrate the skin thoroughly. Supreme Solution is carefully produced with no fillers, alcohols, emulsifiers or binders. The entire skin care product line from Herbalix is synthetic chemical and petroleum free, and the formulas have been developed for men, women and teens alike. Remember that Herbalix makes a great holiday gift for your loved ones. The one especially for men is now ten percent off! Free shipping will make this gift a favorite. Simply look for the basket on the home page. Choose Herbalix products as a holiday gift for your family and friends, and we’ll ship it in time for Christmas – wrapped up in a festive holiday basket. Orders must be received by December 20th. Visit http://www.herbalix.com, choose the products and you’re all set. It is just as important in the wintertime as it is in the hot summer months to naturally hydrate your skin and to drink plenty of water every day. Learn how nutritional ingredients can help infuse your skin with moisture and help enhance the benefits of creams and lotions. Another tip — make sure you are getting a healthy supply of oils via your essential fat intake. Just include fish such as salmon, tuna or sardines to your diet and the oils within will do wonders for your dry skin. Many kinds of seeds and nuts contain high levels of essential fatty acids. You can also add Omega-3 essential fats to your diet. And last, remember to eat a healthy diet, stay out of the sun – even in the winter months and get a plentiful supply of fluids. All of the above will help you maintain your skin cell’s hydration. Top off your skin with the goodness in Herbalix moisturizers regularly and you will keep your skin glowing throughout the holidays!